I’d done my research and booked a hotel within strolling distance of the venue and turned up at 8.14 pm to hear the applause as support act Laurence Jones left the stage! How was I to know that he would start his set at 7.30? This is Rock and Roll for Goodness sake; not teeny-bop music; even accounting for the average age of the crowd, I doubt many had to be back to the old folks home before a 10pm curfew. So, after missing the young Blues prodigy I decided to take a pint; ha! If life was only that simple; the bar had no perceivable queuing system and only two overworked staff. I gave up and mooched around the hall, checking out the two merch stands (2 people selling beer and 2 selling t-shirts and cd’s; hmmm). Thankfully the early stat meant the headline act, King King came on stage at 8.45, so there wasn’t too much hanging around. 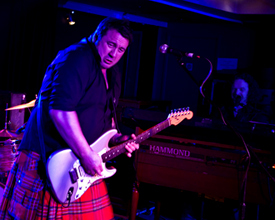 Looking resplendent in a black shirt, red tartan kilt and yellow work boots band leader Alan Nimmo strapped on a futuristic looking silver Strat and blasted into Hurricane from the band’s latest album and it certainly was as powerful as a Hurricane the way the Scotsman and band made their instruments howl. Even though the audience hadn’t heard the song before; the reception was noisy and whole-hearted. I’d seen Alan’s previous band The Nimmo Brothers a few times; but not this incarnation which is several years old and professionally ‘road hardened,’ with Lindsay Coulson and Wayne Procter (bass and drums) providing the fulsome figured and charismatic singer-guitarist to do ‘his thing’ without the fear of over indulging on his solos while Bob Fridzema on Hammond and keyboards links the whole show together and gets to do a few fancy fills along the way, too. The 90 minute set was made up with a well balanced mix of old and new songs; with the slow, sensual Southern Soul sound of Long History of Love and the power ballad dedicated to Alan’s brother Stevie; You Stopped the Wind proving very popular early on. Of the older songs Take My Hand had Nimmo showing what a vocal range he has it soared into the night air while the band added a heart stopping backing to a song I’d not previously liked. Just over halfway through I was standing by the bar as the band launched into the clap-along Breaking Up from the new album; when two fellas pushed their way through the crowd, with one mopping his brow. Within seconds his legs buckled and he was lying on the floor. What happened next really, really impressed me. A barman surveyed the situation and ran to get the doorman who put the fella into the recovery position while telling the barman to phone an ambulance. There was absolutely no fuss; even when the paramedics arrived 3 or 4 minutes later and the man was placed in a chair and taken out of the club via the dressing room. The band played on and 99% of the audience weren’t aware that anything was amiss….just as it should be. Most fans appeared to like the rockier numbers best; but for me the band’s slower more soulful songs like the tear jerker Old Love which ended the concert and showed a more impressive and possibly intelligent side to their playing; in my humble opinion. Aha! During a long and very intricate solo towards the end of this song Nimmo became aware of a barmaid noisily clearing up near the stage and he eventually lost concentration; before playfully chastising her for ‘bothering a man at work!’ He did finish the song; but with a big grin on his face. It was no surprise that following raucous cheering the band returned for two encores songs; the first was another track from Reaching For The Light; but tonight Heavy Load by seminal 70’s rockers Free was dedicated to their bass player who had written the song and died earlier in the day; a more fitting tribute I couldn’t think of, and the evening ended with a call and response Let Love In which ended with a crescendo of stinging guitar playing from Nimmo and 400 people singing their collective hearts out. King King are a helluva live show; encompassing all the elements of the British Blues-Rock that I grew up with; reminding me of Free and Stone the Crows and Nimmo’s impressive guitar playing might owe a debt to Albert ‘Iceman’ Collins and Gary Moore; but he certainly has his own distinctive and recognisable style.